by Arpad Okay, Clyde Hall, Brendan Hodgdon and Jarrod Jones. Undercover is our opportunity to lovingly gaze upon gorgeous works from magnificent artists. From Michel Fiffe’s bitchin’ ‘G.I. Joe: Sierra Muerte’ cover to Francis Manapul’s ‘Green Arrow’, here’s what we’re loving this week. JJ: IDW Publishing invited Michel Fiffe to their latest Hasbro happening, and I’m all about it. 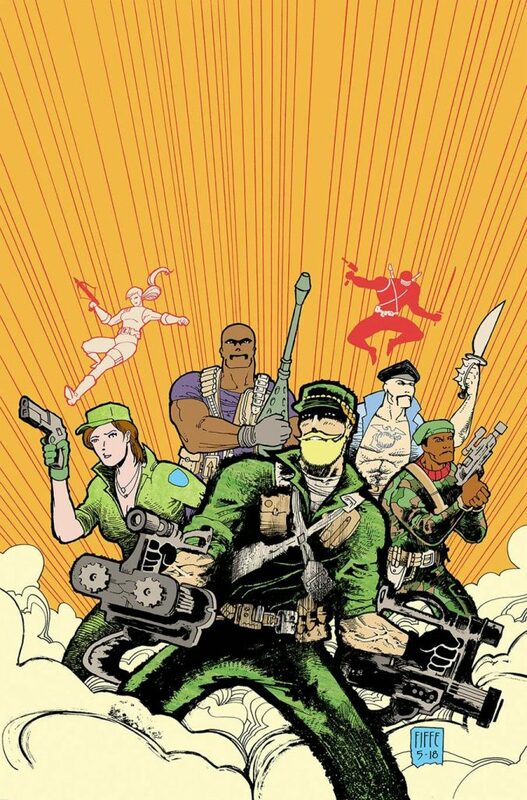 Weirdo Copra sass, wiggly line art, the kind of ink-on-your-hands comics that makes Fiffe a newly-forged legend in our eyes, its all here for this latest G.I. Joe romp. And then some. Fiffe has access to the entire toybox and does precisely what any of us would do. He upends the entire damn thing, grabs his favorites, and assembles them for a most bitchin’ cover. 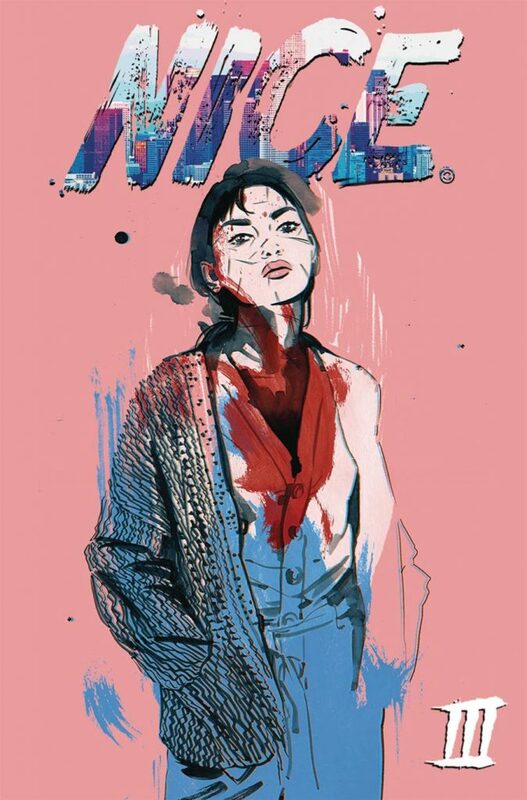 Only the iconic may vogue with Fiffe. Roadblock, Lady Jaye, Gung Ho, Scarlett, hell, throw in Snake Eyes; it’s time for first impressions with the uninitiated and G.I. vets alike. It wouldn’t do to disappoint. This artist is no stranger to standing out. And he’s a total pro. Leaves plenty of space for the brand’s iconic trade dress—which, by the way, looks incredible on this image—and fills in the rest with rays from the goddamned sun. A brilliant burst of Saturday morning bravado, busting up the corporate house-style monotony we commonly associate with the new release shelf. AOK: Tula Lotay is exactly who you want working on the cover to your comic because every choice Tula Lotay makes is the right one. Which paint scrapes and dots to leave, the splatters and scratches that form a halo around an equally scarred and bloodied angel. The light hits her right and washes out the details in an oversized sweater, a field of zigs, zags, and pearls, perfect, present in shadow, absent in focus. Her shadows are watercolor stains, her hair a wash, the cardigan under her robe faded strokes of brush. Every single thing about this drawing says art, process, tools, creation, mastery. Almost everything. The cornerstone to this cover isn’t Lotay’s breathtaking ability to incorporate the making of art into art itself; it’s returning the spectator’s gaze. Eyes meet ours with palpable emotion. Indifference at best. Disdain at worst. I see your eyes on me, they say, on my figure, on the blood, the scars on my face. You’re next. CH: The Controller is a villain who transforms a player’s gaming fantasies into deadly, destructive actuality. “It’s just a game,” the altered reality assures. 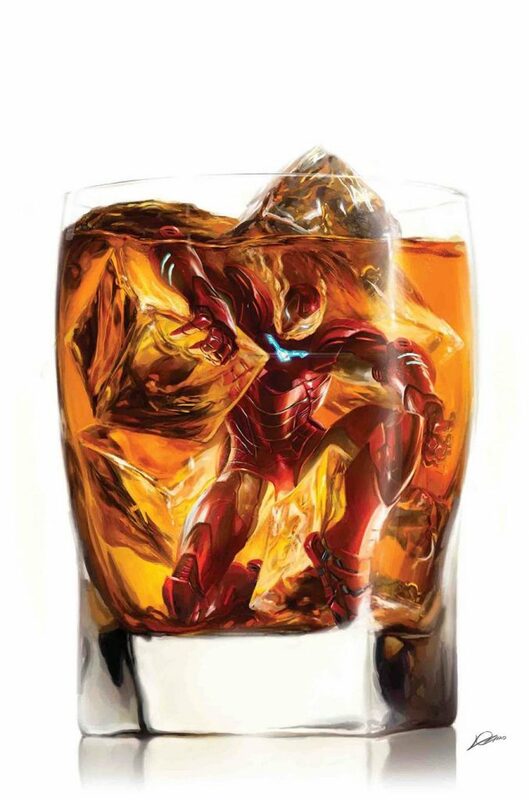 But it’s far from that, leading to the question posed in the promotions: Can Tony Stark be made susceptible to a “Digital Demon in a Bottle”? Artist Alexander Lozano took the opportunity to create a stunning illustration founded on the concept. Alex Ross has been killing it lately with his Immortal Hulk covers, but Lozano’s cover for Tony Stark: Iron Man #8 places him in the same upper strata of excellence for my money. The superhero no one can touch thanks to the veritable tank he wears has been vulnerable to alcoholism ever since David Michelinie’s and Bob Layton’s 1979 classic, “Demon in a Bottle”. It switched up Tony’s ongoing heart ills for a much more relatable kryptonite. The most desperate battle rages beneath his armor, even turning that high-tech protection into a liability. Lozano’s captured this perpetual state of defenselessness succinctly. Crushingly. Iron Man’s in deep water. Only it’s not water, and the ice cubes of the tumbler join with its contents to keep him trapped like an iron fly in amber. Meantime, precious oxygen escapes the suit. In a simple tumbler and with his lifelike style, Lozano has created the ultimate deathtrap for this hero. Taken purely at face value, the piece makes a reader want to quick-catch a breath as we become fully invested, fully empathic, with Stark’s plight. For those who suffer from the disease of alcoholism or have experienced a friend or family member who does, the sharpness of the image cuts deeper. For us, we’re again made witnesses to the struggle, one we desperately want to end in victory. In life, addiction more often wins. Here Lozano’s arranged a ringside seat in Tony Stark’s corner, and our hero’s triumph will be the sweeter for it. BH: The hunter moves through the brush, bow at the ready, seeking his prey. Of course, Oliver Queen is less likely to be hunting wild game than he is supervillains and a measure of justice. But even so, he still has that fearsome, furrowed focus that one might expect from DC’s great Longbow Hunter, in this great cover from Francis Manapul. 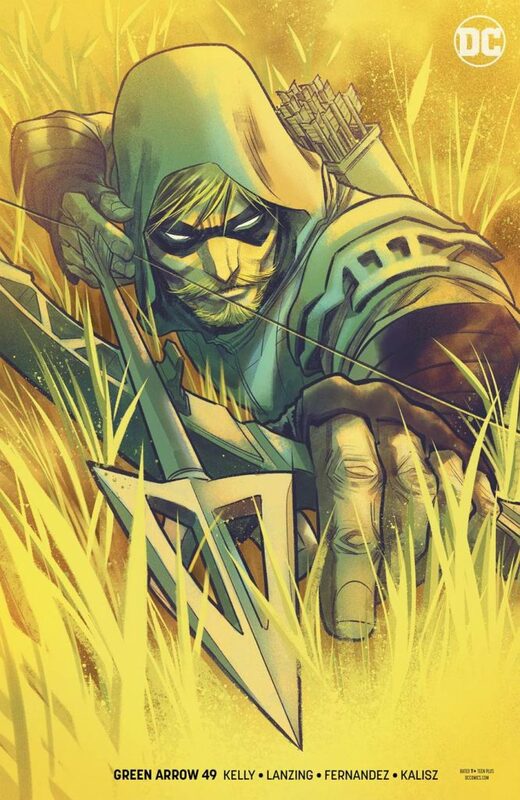 With Green Arrow’s solo adventures suddenly wrapping up with next month’s issue #50, it feels right that there be a few extra bits of beauty to help celebrate the Emerald Archer, and Manapul is certainly doing his part. The cover might not directly reference the reality-twisting predicament of Collin Kelly, Jackson Lanzing & Javier Fernandez’s already-too-brief “Count Vertigo” story that continues within the book. However, the composition still cuts to the core of what makes Oliver such a compelling and resonant character. The color also contributes to the success of this cover, with warm yellows recalling both the nostalgic sepia tone of old photographs and the comforting embrace of a setting sun in equal measure. It suggests the closing of a chapter, if not the total end of a story, which hopefully is true of Green Arrow’s adventures in the coming months.